BrightEdge has a powerful set of tools for taking a close look at how your keywords are performing (individually, by keyword group, overall, and relative to competitors) and also offers a comprehensive analysis of your site’s SEO efforts, both on-page and off-page, and provides specific recommendations that you can take action on in order of priority. There is also a built-in workflow management system that makes it simple to assign tasks to anyone else in the system and monitor its progress. However, the analysis and recommendations focus solely on organic SEO, so if you’re interested in analyzing your PPC campaigns, you will need another tool. BrightEdge provides a nice overview graph of how your keyword rankings have changed week-by-week in terms of the number of keywords displaying on the first, second, and third pages of a search engine (Google, Yahoo, Bing). A unique feature they offer is the tracking of your “Blended Rank” versus “Classic Rank.” Blended Rank tracks how your keywords are performing across all listings in Google (video, images, places, shopping, etc. ), which gives you a more accurate picture of your keyword performance if they’re appearing in multiple listings. Beyond the overview graph, you can drill down to display whatever level of granularity you desire, whether it’s as high level as keyword performance by keyword group, or as low level as how the rankings of individual keywords within a single group have changed from one week to another. A nice feature are the reports that show keyword ranking performance relative to social signals – Facebook likes, tweets, and Google +1s – over time. This is useful in understanding how your investments in social media are impacting your rankings, and not something you often see in other tools. The Backlinks Report shows you not only the backlinks for your website, but the backlinks that your competitors have and you don’t. This makes it easy to piece together your competitor’s backlink strategy and identify domains that you could link from as well. This report is generated through integration with Majestic SEO and Moz data. 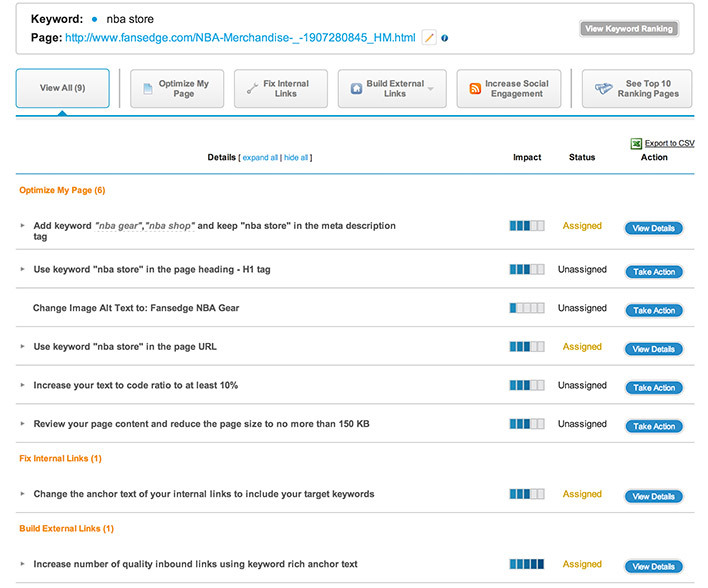 BrightEdge really shines in the analysis and recommendations offered to improve your keyword performance. It gives you an attack plan, by looking at all keywords and all pages across your site and then telling you what keywords and pages to start working on first. If keywords are your focus, it shows you the top 25 keywords you should focus on first and then presents you with specific recommendations for each. It also shows you the top 10 pages ranking for each keyword so you can quickly see what your competitors are doing differently. And with the built-in workflow management system, the tool allows you to assign each individual recommendation to the necessary person in the system that should be implementing it, and then track the progress of the task all from within the tool. Similar to the keyword recommendations, you can also see the top 25 pages you should work on first, in priority order. And it asks you if you prefer to measure importance by search volume or page authority. You can then view the recommendations for each page sorted by: on-page issues, internal links, external links, and social engagement. The recommendations are quite detailed, including advice on how to improve your meta data and what sites you should look to for link building opportunities based on links your competitors have acquired. For social signals, you can see the top 25 keywords for Facebook and Twitter that will give you the biggest back for your buck when you implement the given recommendations. The tool also shows you how your tweets and Facebook likes and shares stack up against to the top 10 ranking pages. The SEO Performance Analysis report shows you all the keywords that your website is ranking for, regardless of whether you are tracking them or not. The tool also assigns a value to each keyword based on an algorithm that includes cost-per-click so that you can prioritize the list and identify keyword opportunities that you maybe hadn’t thought of. You can generate this report for your competitors as well, and using the built-in filtering, you can customize the view of your competitors’ keyword list to any specifications you desire. For example, you can filter the list so that it only shows keywords that have a value greater then X and a rank less than Y. And when you do identify a new keyword opportunity, the tool makes it easy to select those keywords and easily assign them to new or existing groups so they can be tracked in the future. From the keyword level you can take the analysis up to the page level or subdomain level and identify which pages on your site or your competitor’s site are performing best. From there you can select individual pages to see what keywords each page is ranking for. The Keyword Discovery Report identifies all those keywords that your competitors rank for and you don’t, and displays a pie chart that illustrates how well your competitors’ sites are performing relative to those keywords. In the PPC Discovery Report, Adwords data is pulled in to show all keywords related to your site, tracked or not, that have ads that are being clicked on. The Share of Voice Report shows who the top competitors are for each keyword group by market share. The report includes a trend graph that makes it easy to identify when new competitors are entering the arena. The report also makes it easy to drill down into the individual competitor pages that are ranking for certain terms and get insight into their on-page SEO, external links, social signals, and other keywords ranking for each page. Site Audit calls out all the errors you have across your site (e.g. missing tags, duplicate content, long titles) and makes it easy to export them to a CSV file, grouped by the severity of the error or type of error. The tool also offers a trends view to see how errors across your site have progressed over time. Embedded within the tool itself is a task and workflow management system that allows you to assign recommended tasks to anyone in the system and create ad hoc tasks. Each task has an owner, status, and due date and the aggregate task list can be sorted by either the page or the keyword they relate to, or the user they’re assigned to. The tool makes it easy to see what tasks are almost due or overdue and you can generate reports that show what changes you have made to your site over time. Like many tool makers, BrightEdge is secretive about their pricing. While enabling them to present potential customers with a customized quote, this lack of transparency makes it very hard for someone not intimately involved in the sales process to determine the costs and compare competing services. Information from sources such as Quora point to BrightEdge’s pricing being somewhere around $4000 per month for Enterprise clients, with substantial discounts available for startups and smaller firms. We invite an official BrightEdge representative to post a comment stating their pricing. Comments directing potential customers to contact sales staff for pricing info will not be shown. Medium and large businesses have the most to gain from a tool like BrightEdge because of the ease with which SEO tasks can be assigned and tracked from within the tool. But if your business is not set up to leverage this feature or you’re an independent SEO consultant, you can still gain some great insight from BrightEdge particularly if you’re looking closely at social signals and also monitoring new competitors in your keyword space. However, the bulk of the data that the tool offers can be obtained from other tools like Moz offers. 1) Does BrightEdge disclose their data sources? 2) Does BrightEdge work for Local SEO clients? The “Keyword Performance by Keyword Group” analysis shows results for NYC, Chicago, Houston and San Francisco. Does BrightEdge work for smaller cities, too? Hi Alex. BrightEdge openly discloses that they integrate data from several major web analytics tools and databases including Google Analytics, Adobe SiteCatalyst (Omniture), Webtrends, Coremetrics, Majestic SEO, and Moz. For targeted hyper-local search, BrightEdge has data for only the major cities worldwide. They currently have data for over 169 cities, and they add more cities with each new release. Very useful review, Claudia. Thanks for putting this out. BrightEdge’s use of Deep Web Interferometric Analysis (comparing dissimilar signals) is revolutionary for the metrics industry. People need to sit up and take notice of this advance in traffic analysis. For smaller agencies, what are other similar tools to be reviewed for a similar workflow / recommendation / reporting outputs? Excellent review here, Claudia! Thanks for putting the time into this post. I’ve been looking for a solid review on this tool as I’m thinking of using it for our company. Thanks for the tip on BrightEdge. We are definitely going to try this thing out on a few clients. Great post! I use Brightedge for one of my clients, and have always had a good experience. The one recommendation I would make for teams thinking about investing in a tool like this: Be sure that you have the appropriate team in place (with enough time and expertise) to take action on the recommendations and learnings you get from Brightedge. The value of the tool goes down tremendously if the recommendations can’t be implemented. Other than that, I highly recommend the tool! to say. I even shared it on Facebook this time around. I believe it is $5,500 a month at this point.